Highest Position : 1 ... for 6 weeks ... from 26th March 1966. Detail : The Beatles eleventh official E.P. 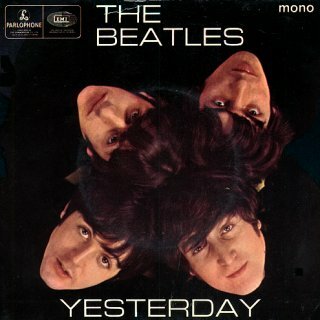 Despite "Yesterday" reaching number one in the States, and the fact that it was not released as a single here, the inclusion of "Yesterday" failed to take this collection of tracks from the "Help!" album into the singles chart. Although it did, of course, reach No.1 in the E.P. chart. Even though stereo was becoming more popular, this E.P. was issued in mono only. The E.P. was released in a picture sleeve, with once again an interesting photograph by Robert Whitaker. 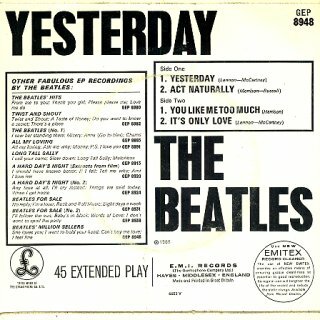 First pressings had around the edge of the label, the words stating the rights of the publishers starting with "The Gramophone Co. Ltd." and across the press-out centre the words, "sold in U.K. subject to resale price conditions, see price lists" are present.